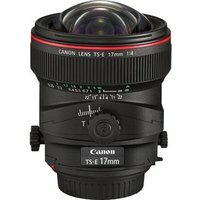 The Canon TS-E 17mm f4L ultra-wide-angle tilt and shift lens has been specifically designed by Canon for architectural photography. Featuring low distortion and excellent edge-to-edge sharpness, lens offers independent rotation of Tilt and Shift mechanisms to allow perspective and depth of field to be controlled separately. With a 104° diagonal field of view combined with ±6.5° of tilt, plus ±12mm shift and ±90° of rotation on both tilt and shift mechanisms, this is one of most flexible lenses on market. Canon TS-E 17mm also features locks on tilt and shift mechanisms to ensure that unwanted movements are avoided.